Listening to our customers, were have added this compact size CAMO kit to our product line. Packed in a rugged camouflage style duffel bag, this kit is designed to keep hikers and travelers safe and provide them with the means to overcome outdoor emergencies. Of course this kit can also be used at home, the office, the car or anywhere else. 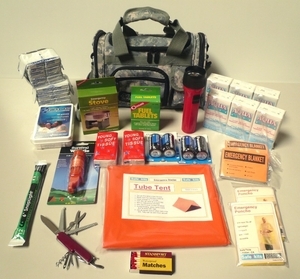 What comes inside our 2 Person Hikers' CAMO Survival Kit? The kit has been assembled with outdoor survival in mind and contains emergency food and water, disaster tools, safety items for personal protection, lighting and first aid products along with means to boil water or heat up food.